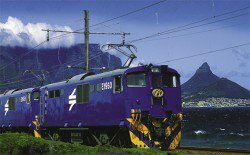 In 2016 The Blue Train will be heading up to �Big 5� country with the launch of its brand new Hoedspruit departures. The Blue Train will make two round trips up to the Limpopo Province, one in July and the other in August, offering guests the choice of four spectacular 19-hour one way journeys. These new departures will enable some fantastic new �rail safari� combination packages with the many wildlife reserves and private safari lodges in the Greater Kruger and Sabi Sands area. These one way journeys between Pretoria and Hoedspruit in either direction take 19 hours as opposed to the usual 27 hours between Cape Town and Pretoria and cost around �300 less per person � an attractive option for those with this Blue Jewel on their travel bucket list on a tighter budget. One complimentary night at Camp Jabulani. Nestled within the Big Five Kapama Game Reserve in Hoedspruit, this exceptional experience includes game drives and meals (excluding beverages and elephant back safaris). Camp Jabulani�s classic and elegant interiors seamlessly blend with the rugged African bushveld, providing a warmth and comfort that makes guests feel completely at home. Two complimentary nights at one of our strategic hotel partners in Pretoria or Cape Town, an exciting upgrade on our existing offer! Guests receive 2 hotel nights with breakfast included and a one way transfer between the hotel and station. Options include the Sheraton or Castello di Monte in Pretoria or the Westin or Taj in Cape Town (note Westin and Taj not available 08-13 Feb). While in Johannesburg this spring, we had the opportunity of visiting the main railway station and Blue Train's impressive head office facilities. During this important meeting, our editors were given a thorough update on the company's newest programs and facilities. I have always considered the Blue Train a lifetime experience . . . land cruising across South Africa. Plans are being made this summer for a special series of rail tours organized by our magazine and participating ATA chapters. Watch for news! For years I had read that South Africa held many pleasures for those of an adventurous spirit or romantic nature. So one summer, taking a month's vacation from my job as a travel agent in Ivory Coast, West Africa, I headed south. Here at last was my chance to spend some leisurel y, laid back weeks getting to know that fascinating country surrounding the Cape. While the sights and delights were many and varied, the epitome was my experience aboard the famous Blue Train. It was like the finest luxury cruise, sailing across a sea of ever-changing landscapes . Yet there was time and space to savor every waking moment. (photos to come) I managed to read some pamphlets about the line's history, which spans over 50 years. 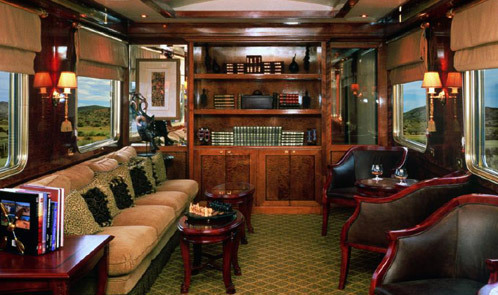 Back in 1928, it became the first luxury train in South Africa. The trademark was its attractive bright sapphire-blue fleet of carriages. Originally known as the 'Union Limited' and 'Union Express' , a legend began when folks started calling them 'the Blue Trains'. Prior to this occasions trains on the famous route were involved in the discovery of gold and diamonds, and in the Boer War of the 1890s. Those cold, soot laden coaches were a far cry from the opulent coaches operating today.